Why N&P Paving & Driveways? What makes us different to other paving & driveway companies? Since starting out in 1995, we have built up an excellent reputation for providing a quality paving & driveways service to homeowners throughout Newcastle and the surrounding areas. N & P Paving & Driveways take pride in ensuring every project carried out is as good as it would be if it were our own home. At N & P we run through in detail our installation process and anticipated completion date with the client and design the project with them giving them accurate estimates for the work involved. With a huge portfolio of our own work we are able to show customers exactly the kind of result they should expect from a reputable paving and driveway contractor. This always gives peace of mind as they know we can back up our claims that our service is impeccable. Our choice of block paving for driveways includes some fantastic designs including the famous North East Beamish Cobbles. Imprinted Concrete Driveways, Permeable Driveways and Traditional Block Paved Driveways – the possibilities really are endless. All work is carried out to the highest standards; we create beautiful pathways, garden walls, steps and much more to ensure your driveway or patio project requirements are fulfilled. At N & P Paving & Driveways we don’t believe in hard sell tactics, we are contractors – not sales people. We simply offer good advice, the right advice and impeccable workmanship and service. We do hope that you choose us! 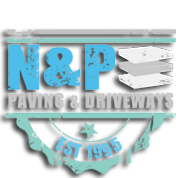 We will do everything we can to give you the confidence that N & P Paving & Driveways can carry out the project for you to the highest standards for your driveway, paving project or patio. We fully understand that there are many things to consider when choosing your patio or driveway even outside of any price you are quoted so rest assured with N & P Paving & Driveways – we will allow you time to consider things properly and will never appear as pushy. All of our paving work is guaranteed for 12 months, which covers all materials and labour. Why not get in touch and take advantage of our experience, professionalism, expertise and of course our Free Survey? We have an extensive range of driveways, paving and patios to choose from, you will be spoilt for choice! To find out more about our services, please feel free to take a look around our site or call us for a FREE no obligation quotation and site survey.